While other Amaryllis are producing flower stems from bare leafless bulbs, this plant has beautiful foliage at all time resulting in a more aesthetically pleasing display. It produces three flowering stems with four flowers per stem, in succession every spring. 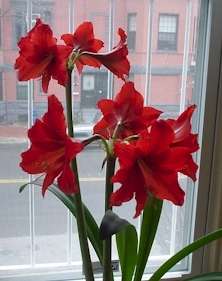 Sometimes, two stems are in bloom at the same time as shown to the right. Amaryllis Scarlet Baby has to be seen to be believed! While there are other red varieties, this one deserves its own page! Up to four intense scarlet flowers are borne on tall stems. Mature bulbs will produce two to three flowering stems per season! 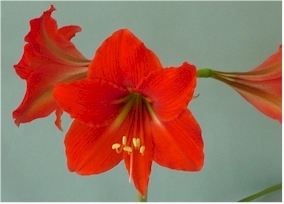 Bulbs and foliage are more compact than standard Amaryllis, with beautiful dark green sword-like foliage. These plants do not need a rest period and can be grown year-round to bloom in spring. Sometimes there will be some variation in the intensity of color possibly due to temperature and growing conditions.